Engineered hardwood is a great flooring option! Hardwood flooring is an excellent choice, whether you choose solid or engineered planks. As summer approaches, you may choose to replace your current hardwood. If you are considering engineered hardwood flooring, make sure you ask these questions! One of the most important questions you must ask yourself during your search for engineered hardwood is what species you want. No matter what variety of wood you need, all engineered hardwood has natural hardwood for a base. Find one that will last as long as you want it to and also one that isn’t high-maintenance. If you’re looking to brighten your space, you could choose maple. If you want a warmer look, then oak is a great choice. The next question you will want to ask is how thick the planks are. You will want to make sure that the top layer of your engineered hardwood is thick enough before you purchase it. Thinner top layers will need maintenance sooner. The top layer will typically be anywhere between 0.5 and 6 millimeters. Make sure yours is as thick as possible. Two millimeters and thicker typically produce the best results. How Does It Survive Damage? 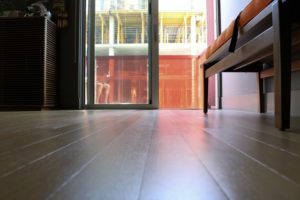 With the busy summer season full of noisy parties and excited guests, you will want to be sure your new engineered hardwood can withstand all kinds of damage. Make sure you pick a wood veneer that is as hard as possible and ensure that it has plenty of wear layers. Since sanding and refinishing isn’t as practical for engineered hardwood, you’re far better off avoiding any potential damage. For starters, make sure you keep it clean. Mopping, sweeping, vacuuming all work. Avoid using any harsh chemicals to clean them too, since this could have some serious consequences. You can also put pads on furniture feet and use area rugs to resist the effects of pets, furniture, or shoes scratching. This entry was posted on Friday, June 1st, 2018 at 12:38 pm. Both comments and pings are currently closed.